Delta Electronics, a global leader in power and thermal management solutions has launched its 30kW wireless battery charging system for the material handling industry. It can charge a 600Ahr-48V battery in 60 minutes. Adding to the company’s growing portfolio of wireless solutions, this powerful charging system is ideal for large and complex vehicles associated with the burgeoning warehouse automation industry. Such material handling equipment includes scissor lifts, forklifts, trucks, golf carts, and Automated Guided Vehicles (AGVs). In addition, the company will also be debuting its 720W and 1.5kW onboard chargers. Onboard charging solutions boast compact, rugged, and feature-packed designs ideal for meeting the growing demands and pace of material handling applications. Delta’s new 30kW solution is the latest addition to its growing number of wireless charging offerings, which can deliver an industry-leading efficiency of up to 93 percent. This significantly outperforms many industrial chargers that commonly waste more than 30 percent of the power consumed from the AC line. In addition, Delta’s solutions enable safe, highly reliable, programmable, and efficient charging for any battery type. They do not need costly cables, connectors and contact plates that can wear down and require frequent replacement. The company’s range of wireless charging solutions cover applications from 1kW all the way to 30kW. Charging systems can be customized to meet the unique needs of a diverse number of installation sites, such as warehouses, factories, ports, and any location where traditional, wired battery chargers are found. 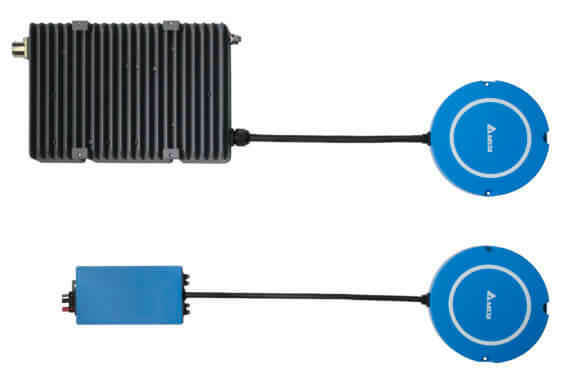 These innovative systems, comprised of a base-pad connected to a wall-box and a low-weight on-vehicle unit, eliminate the use expensive cables, connectors, and contactors, decreasing maintenance cost, and ensuring ease of operation. The transmitting and receiving sections communicate via WIFI and communications with the vehicle are via CAN bus. With an IP65 waterproof rating, the system is durable and allows vehicles to operate in outdoor environments. At the show, Delta will also be introducing two new onboard charging systems. They are designed to efficiently charge the battery in industrial electric vehicles, even in the harshest environments. Developed to easily integrate with a variety of vehicles, such as pallet trucks, scissor lifts, aerial platforms, floor-cleaning machines and more, the 720W Onboard Charger brings material handlers a compact solution able to fit in the smallest of spaces. The charger’s rugged design is also IP65 dust and waterproof. Equipped with a battery temperature sensor, the solution is able to optimize charging, which is fully automated. It also offers extended data storage capabilities, including a full history of the previous 1,000 charges. This provides vital visibility into battery mishandling or early termination of charging. CAN bus is available for connection to smart battery or vehicle systems. Additionally, the interlock feature prevents the vehicle from moving during the charging process. Similarly, the 1.5kW Onboard Charger, also equipped with the interlock feature, brings a durable solution to material handlers to accommodate larger or more energy-intensive vehicles. It is compact, efficient, and feature-packed with a robust die-cast chassis designed to bear the shock and vibration standards of industrial machinery. Most notably, the 1.5kW charger is 100 percent convection cooled, making it particularly suited to applications in environments where water or pollutants are present. 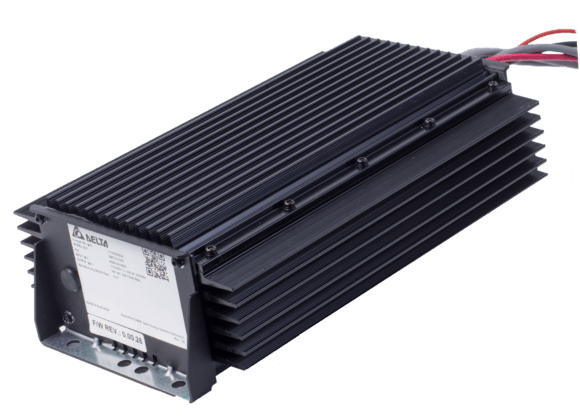 The 1.5kW unit offers several connection options to smart battery or vehicles systems, with additional connections available for an optional external LED module and battery temperature sensor. As with the 720W model, the unit will store information on the past 1,000 charges, which can be easily accessed through a data port. Delta will also have its DC-DC converters on display along with its modular charging stations, which offer reliable, easy, and accurate monitoring to ensure optimal charge, as well as scalability to handle a wide-range of battery types, voltages and amp-hour ratings in one cabinet. These modular solutions are capable of standard, opportunity, and fast charging from 1.35kW to 30kW; come equipped with CAN bus communication; and boast wall or floor mounting options to accommodate any setting. To maximize uptime, these units come complete with easily serviceable fans, pollution protection for sensitive components, and, due to their modular design, the system will continue to operate should one fail. For more information regarding Delta’s charging solutions and show displays, visit http://modex2018.delta-energy-systems.com/. VANCOUVER, B.C.– [March 22, 2018]—Delta-Q Technologies (Delta-Q), a leader in battery charging solutions for electric drive vehicles and machines, has announced the expansion of its capabilities to support the Society of Automotive Engineers (SAE) J1939 standards in its battery charging solutions. Delta-Q now offers the two leading Controller Area Network (CAN) bus communication protocols: CANopen and J1939. J1939 is the preferred CAN standard for in-vehicle networks for trucks and buses in industries such as construction, material handling, electric automobiles, speciality utility vehicles and outdoor power equipment. With J1939 CAN protocol capabilities on Delta-Q’s chargers, the company can support machines approved for these uses. The expansion to J1939 provides original equipment manufacturers (OEMs) the ability to integrate the battery charger’s data into a vehicle system, which includes telematic applications, in a simple and functional manner. This adds to Delta-Q’s full CAN bus capabilities for charge control, and/or charge monitoring, for a more integrated lead acid or lithium system. It also provides OEMs with the flexibility to update battery algorithm and charger software through CAN programs to ensure quality in a vehicle’s battery charge or provide full autonomous control of their applications. The J1939 communication model creates an open interconnected system that allows Electronic Control Units (ECUs) belonging to different component manufacturers to communicate with each other. Integration of J1939 into Delta-Q’s charging solutions further enforces the company as a charging supplier to with capability to support products in industry fields such as e-mobility, golf and military. Delta-Q Technologies is a leading provider of battery charging solutions that improve the performance and reliability of electric drive vehicles and industrial equipment. The company has become the supplier of choice to the world’s leading manufacturers of electric golf cars, lift trucks, aerial work platforms, motorcycles and scooters, floor care machines, and utility and recreational vehicles. The Delta-Q Technologies Software Development team has a combined 60 years plus of CAN programing and customization experience. This team works directly with Delta-Q’s OEM customers to deliver CAN based charging solutions specific to their needs. Delta-Q is headquartered in Vancouver, Canada with a local presence in the U.S., Europe and Asia. For more information, please visit www.delta-q.com. TORONTO, ONTARIO–Electrovaya Inc. has announced that a U.S. Fortune 100 company has placed a second purchase order with Electrovaya for its lithium-ion ceramic forklift battery. The second order amounted to US$ 167,000 (C$ 214,000). This purchaser is one of the five US Fortune 500 companies who have earlier issued initial purchase orders to Electrovaya for its forklift batteries. Over the last three months, Electrovaya has added four Fortune 500 clients for its lithium-ion ceramic drop-in replacement battery and we are pleased with the continuing momentum evidenced by this US Fortune 100 purchaser adding a second purchase order to its initial order last month. The Electrovaya battery can improve productivity, reduce maintenance, and has the potential to reduce peak demand as well as decrease electricity usage in heavy-duty 24/7 distribution and manufacturing environments. The Electrovaya batteries include the proprietary ceramic separator, SEPARION™, which provides enhanced safety and cycle life. While the sales cycle could be long and there is no guarantee that the Company’s initiatives will result in significant orders, Electrovaya is pleased with the performance of its batteries in both testing and initial deployments and this repeat order from a US Fortune 100 Company. Electrovaya Inc. designs, develops and manufactures proprietary Lithium-ion Ceramic Batteries, battery systems, and battery-related products for energy storage, clean electric transportation and other specialized applications. Electrovaya, through its fully owned subsidiary, Litarion GmbH, also produces cells, electrodes and SEPARION™ ceramic separators and has manufacturing capacity of about 500MWh/annum. Electrovaya is a technology focused company with extensive IP. Headquartered in Ontario, Canada, Electrovaya has production facilities in Canada and Germany with customers around the globe. Curtain up for the International Congress for Battery Recycling ICBR 2018: The call for papers is open until January 31, 2018. Contributions are requested on the topics of battery recycling technologies, materials supply in a circular economy, transport and safety, the Batteries Directive revision and a review of worldwide battery recycling activities. The 23rd edition of the ICBR will take place in Berlin next year from September 26 – 28, 2018. As in previous years, the ICBR will bring together numerous experts and decision-makers from the battery recycling value chain, such as battery manufacturers, battery recyclers, OEMs from the electronics and e-mobility industry, collection schemes operators, service and transport companies, policymakers and much more. The ICBR Steering Committee wants to build on the resounding success of the recent congress in Lisbon in September 2017. More than 250 experts from almost 30 countries worldwide attended the ICBR 2017 – a new record. Most of the delegates came from the battery recycling industry and from national collection organizations. OEMs, professional associations, and consultants were also strongly represented. As the assessment of this year’s Congress shows, the participants confirmed their interest in new recycling technologies and future challenges for the battery industry. Safety aspects of the storage, transport, and recycling of batteries continue to attract great interest. Eco-design: A critical approach to battery removability? Those interested in speaking are invited to send a short abstract (minimum of half an A4 page in English) with their key messages to the congress organizer ICM to: info@icm.ch. The title of the presentation should be mentioned with the author’s name. For further information please visit: http://www.icm.ch/. VANCOUVER, B.C.– [October 20, 2017]—Delta-Q Technologies (Delta-Q), a leader in battery charging solutions for electric drive vehicles and machines, has introduced their new ICL900 lithium battery charger – expanding their family of lithium battery chargers to create the ICL Series. The new ICL900 is a 900-watt charger, designed to optimally charge lithium battery systems of any lithium-ion chemistry from 9 to 15 cells in series. Delta-Q’s new lithium charger is suitable for use on any electric machine including scooters, floor care machines, lift trucks, and sports and utility vehicles. “We are pleased to announce the expansion of our lithium charging line. Our products are designed to meet the evolving needs of our customers while providing reliability and long-term performance. The new ICL900 is a perfect complement to our OEM customers as they incorporate lithium technologies into their products” says Trent Punnett, Delta-Q’s vice president of sales, marketing, and product management. The ICL900 has a maximum output voltage of 57V and uses custom lithium algorithms to optimize battery performance and life to meet tough application requirements. The ICL900 also uses Controller Area Network (CAN-bus) communications and carries a comprehensive set of global regulatory approvals, including touch-safe requirements for the European electric vehicle market. Delta-Q Technologies is now accepting sample requests for the ICL900. Delta-Q Technologies is a leading provider of battery charging solutions that improve the performance and reliability of electric drive vehicles and industrial equipment. The company has become the supplier of choice to many of the world’s leading manufacturers of electric golf cars, lift trucks, aerial work platforms, outdoor power equipment, motorcycles and scooters, floor care machines, and utility and recreational vehicles. Delta-Q is headquartered in Vancouver, Canada with a local presence in the U.S., Europe, and Asia. For more information, please visit www.delta-q.com. 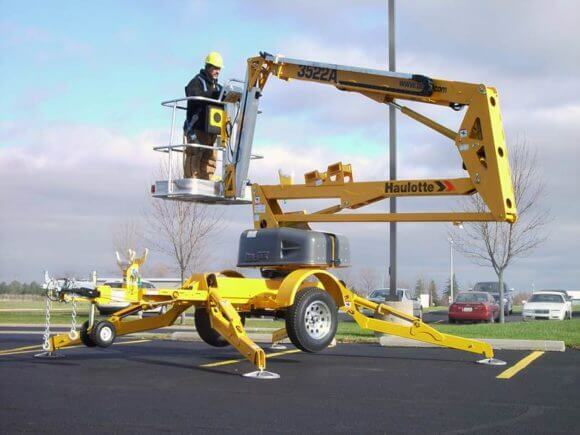 Delta-Q Technologies (Delta-Q), a leader in battery charging solutions for electric drive vehicles and industrial machines, today announced that Haulotte North America (HNA) has selected the company as a charging solutions supplier for their towable boom lift line: the 3522 A, 3632 T, 4527 A, and the 5533 A. “We are pleased to be collaborating with Delta-Q Technologies. Their IC650 battery charger is known in the aerial work platform markets for its reliability, and including their chargers in our products will support our customers in owning machines that are ready to run with little maintenance, “says Steve Watts, Haulotte’s VP of Sales. “Being selected by Haulotte North America is a major accomplishment for Delta-Q Technologies. The Haulotte Group is known to offer some of the industry’s leading products and this contract means Delta-Q has met the expectations of their experienced engineering organization.” says Trent Punnett, Vice President of Sales, Marketing, and Product Management at Delta-Q Technologies. Delta-Q Technologies is a leading provider of battery charging solutions that improve the performance and reliability of electric drive vehicles and industrial equipment. The company has become the supplier of choice to many of the world’s leading manufacturers of electric golf cars, lift trucks, aerial work platforms, motorcycles and scooters, floor care machines, and utility and recreational vehicles. Delta-Q is headquartered in Vancouver, Canada with a local presence in the U.S., Europe, and Asia. For more information, please visit www.delta-q.com. Electrovaya Inc. has secured initial purchase orders under a contract with Walmart Canada for its forklift battery systems. The retailer will convert the forklifts in one distribution center from lead-acid batteries to Electrovaya’s drop-in lithium-ion battery systems. Electrovaya’s lithium-ion forklift battery line, ELivate, features its ceramic separator and industry-leading cycle-life. The purchase orders are worth approximately Cdn $4.3 million and deliveries are to be made by Q1, CY 2018. The many benefits of Electrovaya’s ELivate batteries were demonstrated through extensive testing by the retailer in its distribution warehouses and by the forklift OEM, before this Purchase Order was issued. Lithium and the Rechargeable Battery Market: What Can We Expect for the Next 10 Years? 1. Mr Pillot, the powerful Lithium-ion batteries are predicted to grow strongly. How is the current demand for these batteries developing? I will present detailed figures at the ICBR 2017, but I can say that the LIB market achieves more than 90 GWh demand in 2016, that means a 25% average growth rate per year for the last 10 years. 2. In which areas of application is the strongest growth recorded? The trend continues unchanged; Automotive and e-buses, mostly in China show the strongest growth. In 2016, Automotive and e-buses consume 50% of the LIB. Other applications are portable devices (35%). 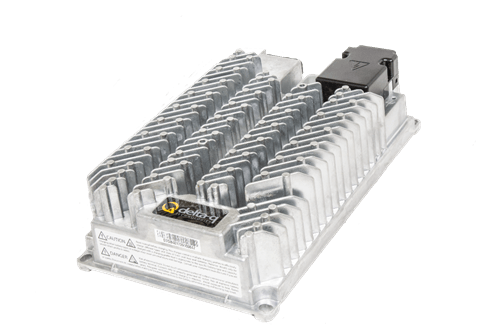 Then, stationary and industrial applications start to use Lithium-ion batteries and replace sometimes lead acid batteries. 3. How do battery manufacturers react to the high demand for Lithium-ion batteries? Are there any plans for new production capacities known? Huge investments are on the way in China and Korea but also as you know in the US with TESLA and in Europe. LG and SAMSUNG will both start Lithium-ion production in Europe in 2018. 4. The recycling of Lithium-ion batteries is only worthwhile in case of high volumes and high Lithium prices. What is the current trend for the Lithium price? The Lithium is not the major metal issue in a Lithium-ion battery. Cost of Lithium represents less than 2% of the battery pack. Cobalt, Nickel or Copper are more important in LIB batteries than Lithium. Nevertheless, the Lithium price increased because most of the Lithium is consumed by the battery industry. It increased from 7 US$/kg to almost 25 US$/kg on the spot market at the beginning of 2016. 5. In a foreseeable future do you know about any technology that will replace the current Lithium-ion chemistries? No. Lithium-ion will be the major choice for portable devices and automotive in the next 10 years. Li-Sulfur, Li-Air, fuel cells and so one will not be on the mass market before at least 10 years. 6. Do you foresee a significant development in Europe for batteries technologies in a particular field of application? Major application in Europe will be Electric & Plug in hybrid. Then, on a longer term basis, lead acid starter batteries could be replaced by Lithium-ion in stop-start cars, micro hybrid cars, 48v batteries. For all the details on the program and how to register, go to http://www.icm.ch/icbr-2017. Advanced Charging Technologies Inc. (ACT) is pleased to announce that it has completed the UL/cUL certification for the 380VAC and 80V Quantum chargers. The new 380VAC chargers will expand Quantum sales into Latin and South America while the 80V chargers will allow ACT to meet growing demands for 80V forklifts. The 80V Quantum charger also lays the groundwork for ACT to enter the airport ground support equipment (GSE) market. “This represents another milestone in the Quantum product line expansion. The new products will allow ACT to exploit new market opportunities,” comments ACT President, Bob Istwan. Advanced Charging Technologies (ACT) is a high-tech company offering a complete line of battery management products including intelligent high frequency conventional, opportunity, and fast battery chargers, advanced battery monitors, and cloud-based monitoring and management solutions serving the industrial motive power battery market. ACT’s portfolio of battery and charging solutions are sold and serviced exclusively through the Deka Battery Dealer Network (East Penn Manufacturing Co., Inc.), the world’s largest and most modern independent battery manufacturer.